Excellent Family Vacation Value ...Save $$ Vacation Well !! You will be hard pressed to find a better beach vacation value than this! If you are looking for a quiet, low traffic vacation spot, this is it! Wake up to quiet mornings, nestled on the top floor (3rd) amongst grand oaks in view of the ocean and earshot of the rolling surf. This is a place for your family; it is a place your children will love. 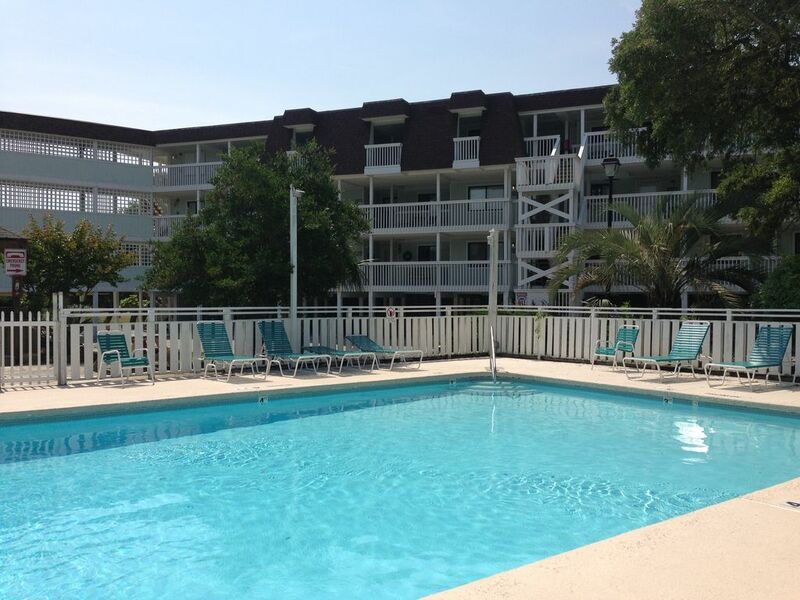 This 3BR-2BA condo sleeps 8 at Pleasure Island’s premiere seaside resort and is an elevator building. It is just across the street from the ocean, with it's own outdoor pool, covered gazebo and grilling stations. It is adjacent to tennis courts, a childrens playground, basketball court, shuffleboard courts an indoor recreation center with a large indoor heated pool, hot tub, mens /womens locker rooms with dry saunas and a fitness center equipped with machines and free weights. The condo is equipped with all appliances (microwave, washer/dryer, dishwasher, coffee maker, toaster) and is ready for your comfortable and cozy beach get away. Bed sizes include 2 queen, and 2 twins in up/down trundle formation. Note: Linen and bath towels are provided. If short stay guest want to bring their own they can make that request for a 25 discount. Call us about weekly and daily specials. Top floor of elevator building, easy access, quiet dwelling even during the busiest of summer weeks. Broken View of Ocean Across tree tops and sound of Surf is apparent . Linens can be provided for 15 per bedroom. There is a 15 dollar penalty per bed if beds are slept on without linen. Guest can request linen or bring their own. Guest can request a kayak trip with owner in basin area just south of the condo. A half day is 40 and owner provide tandem kayak. Holes in bedroom wall where shelving originally existed. Difficult turning off stove burner. Had to pour water in bathroom toilet after previous user since it took too long to refill tank. Dryer did not dry very well. We had a good time at beach. Just was disappointed that pictures on VRBO was somewhat misleading. Its so unfortunate when a guest says nothing during the stay. We always want to hear if something is not to expectations so we can remedy it right away. Myself or my co-host is always ready to visit a situation and make it right given the opportunity, no matter how small the problem. Christine originally asked me to reduce the price....I did and I figured we were off to a good start . She never contacted me regarding anything during her stay but I think its fair I address each item for potential guest that might read her review and have questions. There are a few screw holes in the sheetrock of the front bedroom where a shelf was pulled loose this summer. A spoon of spackle and it will be OK. This is one of those end of season repairs that is better to let wait than squeeze in between guests. The toilet takes about a 55 seconds to refill after flushing so you can't do a repeat flush right away. The flush force is adequate and the toilet is in great shape. Nobody has ever complained about a slow refill as I can remember. This is a first. The washer and dryer are a stackable unit... small....so if it is over loaded it will take a long time to dry because there has to be room for towels to fall and tumble. The washer /dryer unit is great for small batches of clothes. This is the first complaint I've ever received regarding the washer /dryer. I do caution guest to not load it with too many heavy towels. The knobs on the stove click and pop up when they are off. Most people have no issues finding the off position. Occasionally my cleaning staff will remove the knobs and not put them back on aligned correctly and that might have been an issue here....not sure. The stove is not new but still works well. Its unfortunate Christine says the listing is misleading. It sounds like the condo is riddled with issues....which certainly is not the case. The condo is an excellent value. Its updated in some areas and not others. We've added some new and cool décor and it is always clean. Its in a great location of the island, quiet, top floor and has both indoor and outdoor pools to enjoy as well as the beach that is just across the street. It is a great value and what you see is very accurate depiction of what you can expect. We always address any issues our guest have right away if they text me. It would have been nice had Christine allowed us that opportunity. Had a great time. Property in a great location. Condo was clean with everything needed. We did not have to waste time shopping for household items. Pool was very well maintained. We will return. It was a great week and a perfect spot, sat in the sun in the afternoon on the private deck after the sun had left the beach. Everything you need was at your finger tips. Worth it! Hope to return.. Location provides many options with the beach across street; outdoor pool within steps of condo; rec center nearby with indoor pool, sauna, tennis court .. Overall an excellent value for money! Owner extremely gracious and response couldn't be quicker! Hope to visit again! This guest was indeed satisfied but is old school and does not realize a 4 star out of 5 is not so good. VRBO needs to equate their star system to grades in school like A+, A, A-, B,C, D, F etc. I'm not the only owner that is left shaking their head when a great review is deemed poor because of the antiquated scale. Other vacation sites are guilty of the same. These were great guest and I'm pleased to have them anytime. Nice Condo with awesome pool and great beach access. The place has lots of amenities for all ages and away from major traffic but convenient to everything, especially pier, aquarium and historic fort fisher park on south end of island. Carolina Aquarium, Kure Beach Fishing Pier or a ferry waiting to float you to historic Southport.